What with their girth, large trees may seem indestructible but though they may withstand most things, hurricane-force winds, lightning, and floods brought about by non-stop rain can wreak havoc on the plants. From their root system up to their trunks and branches, extreme weather can permanently damage your trees, or even—in the case of lightning strikes—kill them outright! The first, and the most effective step to storm-proof trees is by keeping them strong and healthy long before a storm arrives and ruin everything in your yard. There is no question that healthy trees can withstand most extreme weather conditions compared to weaker ones. Branches are less likely to fall and cause damages on the plants’ immediate area when the trees are strong and completely healthy. There are several things that you can do to ensure that trees grow healthy. Providing them with proper water, regular and corrective pruning and fertilizer depending on the species are the most important steps. Just make sure to start these routines when trees are still young. Don’t wait for your trees’ health to decline before you start taking good care of them. At first, you may think that tree pruning damages your tree what with all the sawing off of branches and thinning its foliage. However, when pruning is done in the proper way, it can help trees withstand storms. It is highly advised that you start pruning your trees while they are young in order for them to develop a strong central trunk. Pruning has a lot of advantages. Besides removing dead and weak branches, it also boosts proper structure and growth of your trees. Regularly conducting tree pruning can shape your trees in becoming more resistant to weather damage. But, the result of tree pruning greatly depends on how it is done. When done improperly, the effects of tree pruning may be counterproductive. Roots may be hidden underneath the ground but they are actually critical to the total stability and strength of any tree. They can be considered as the tree’s anchor, keeping them stable even when the winds are strong enough to uproot the whole tree. In order to keep the roots of trees deeply grounded, you have to minimize activities that may impede its growth or compromise the nutrients of the soil where your trees were planted. Some activities to be avoided include construction work and excavation. One of the best ways to help protect your tree’s root system is by mulching the ground. Putting an extensive mulch ring around the tree’s base has numerous benefits which include preserving the nutrients and water from the soil; it even prevents weed growth. Be careful, however, not to place the mulch too high up the trunk – the critical gas and air exchange is at the base. Aside from the root system, the trunk of the tree should also be protected. If you are expecting a strong storm in your area, you can provide a tree’s trunk added protection by wrapping it with protective material like row cover or even burlap. These materials can protect your tree against flying debris, but need to be removed after the worst weather. If your area frequently has storms, then you should be extra careful with the trees you are planting in your yard. 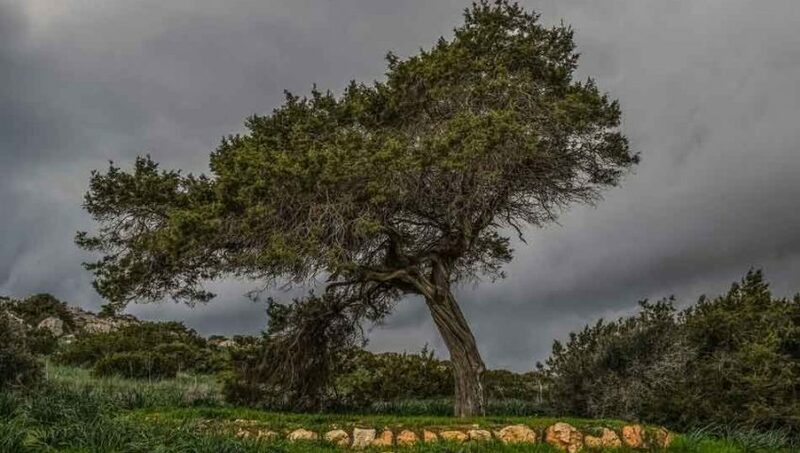 There are several tree species that can withstand the storm better than any other species. As revealed by Kansas State University horticulturist Bob Neier, the red maple, red oak, linden, bald cypress, autumn blaze maple, and the Austrian pine are some of the sturdier trees. In general, trees that are healthy endure storms way better than the rest. If you don’t want your trees to end up deteriorating due to extreme weather conditions, then be a responsible tree owner—provide the plants with proper watering, regular and corrective pruning and nutrients. And as what we always say, talking to an expert team or arborist can also make a huge difference in how you protect your trees. These professionals are the right experts to address your concerns and questions regarding your trees.